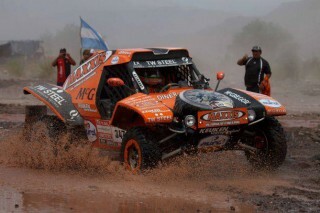 Tim Coronel and Stephany Manns make the podium in Lima for the Dakar rally races 2012. For him its a special finish, he has managed 5 out of 5. Finishing five Dakar rally races in a row, and this year he has managed to make it in 45th place. Its also been a really good result for Stephany Manns, especially beeing able to finish her first Dakar in 65th place.